Sgt. 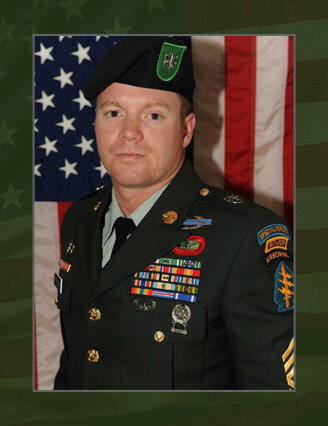 1st Class Duane A. Thornsbury died from injuries as a result of a non-hostile vehicle rollover during a combat mission in Baghdad, Iraq, Sept. 12, 2009. He was medically evacuated to the 10th Combat Support Hospital in Baghdad where he was pronounced dead. Thornsbury, 30, assigned to Alpha Company, 2nd Battalion, 10th Special Forces Group (Airborne), Fort Carson, Colo., was deployed to Iraq in support of Operation Iraqi Freedom as a member of the Combined Joint Special Operations Task Force – Arabian Peninsula. Thornsbury, a native of Clinton, Md., grew up in Bridgeport, W. Va., enlisted in the U.S. Army Reserves April 1996 as a 92Y, Supply Specialist and came onto active duty service September 2002. He later attended the Special Forces Qualification Course, earning his Green Beret in 2006, as a Weapons Sergeant. Thornsbury’s military education includes the Combat Life Savers Course, Warrior Leader Course, Air Assault Course, Basic Airborne Course, Basic Non-Commissioned Officers Course, Survival, Evasion, Resistance, & Escape (High Risk), Special Forces Qualification Course, Ranger Course, and Jumpmaster School. His awards and decorations include the Bronze Star Medal, Meritorious Service Medal, Army Commendation Medal, Army Achievement Medal, Army Good Conduct Medal, Army Reserve Component Achievement Medal, National Defense Service Medal, Armed Forces Expeditionary Medal, Iraqi Campaign Medal, Global War on Terrorism Expeditionary Medal, Global War on Terrorism Service Medal, Non-Commissioned Officers Professional Development Ribbon, Army Reserve Component Overseas Training Ribbon, Armed Forces Reserve Medal, NATO Medal, Special Forces Tab, Ranger Tab, Combat Infantryman’s Badge, Expert Infantryman’s Badge, Senior Parachutists Badge, Parachutists Badge, and the Air Assault Badge. Thornsbury is survived by his brother Dana of Marysville, Pa.